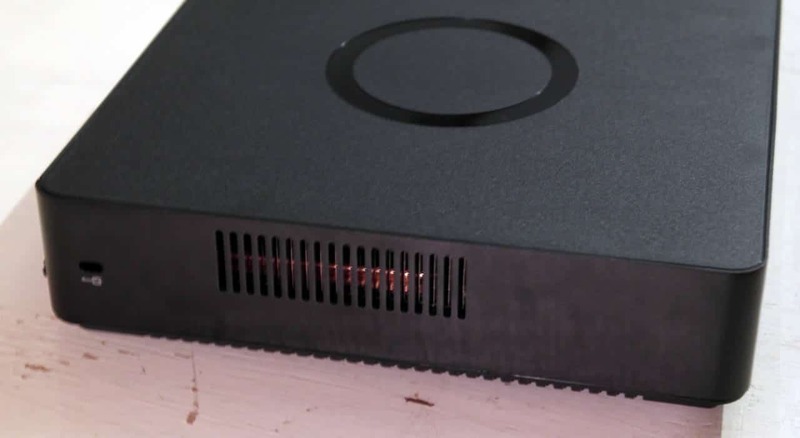 Mini-PC’s usually come with a lot of compromises due to their small size. They for example rarely are fit for any serious gaming. The Zotac Magnus EN970 though is different. 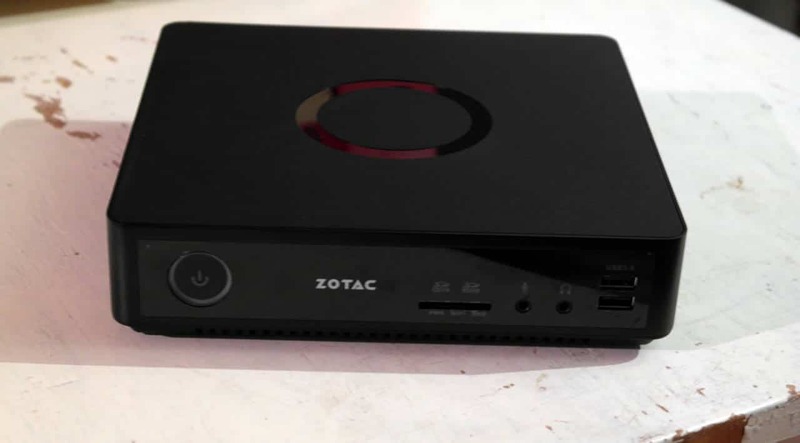 It still is a small mini-PC, although not as small as some of the other Zotac mini-PC’s we have reviewed, but it comes with a discrete graphics chip, a GTX960 (or more exact a variant of the GTX970M), which means it suddenly becomes a viable gaming machine for your TV. The downside to this? Well, at $799 for the barebones system without any memory or storage it certainly is not a cheap option. Is it still worth it? We hope you will know by the end of this review. A couple of things stand out when we look at the specifications. We still get a compromise when it comes to the CPU as it is a low power Core i5. A regular Core i5 simply needs a lot more cooling than you can get in such small case. The naming of the PC is a bit misleading. It is called EN970 which means many will think it has a GTX970 in when you look at the specifications and what MSI Afterburner and GPU-Z is saying it is a GTX960. However, as you dig deeper and for example use the “lookup”-button in GPU-Z things get even weirder because it directs you to a page about the GTX970M. So the big question is why Zotac is not just saying that it is a GTX970M? The answer is that the performance of the GTX970M is close to the GTX960 and not the GTX970 so it might confuse buyers less. 2 gigabit ethernet ports and 4(!) HDMI-out-ports. This seems like a big overkill on a system that is perfect for the living room. To be fair though Zotac is advertising it as a mini-PC that can handle multiple screens. 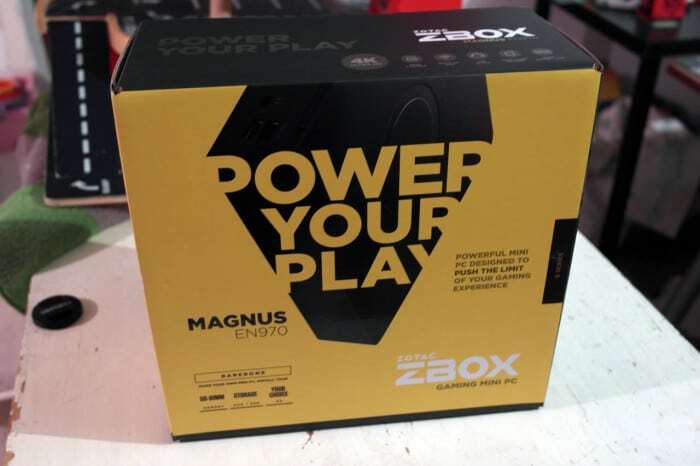 We applaud the decision of Zotac to include drivers on a USB-stick, especially since this PC does not come with an optical drive. 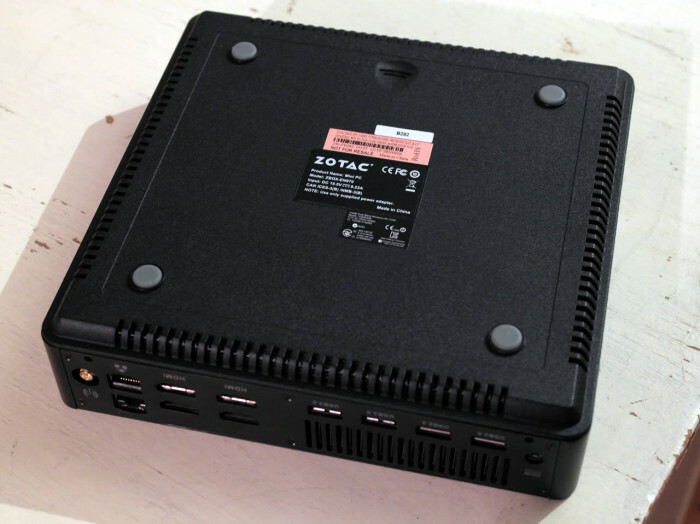 As mentioned in the beginning the Zotac Magnus EN970 is larger that the previous mini-PC’s we tested from Zotac. That does not mean it is big though. 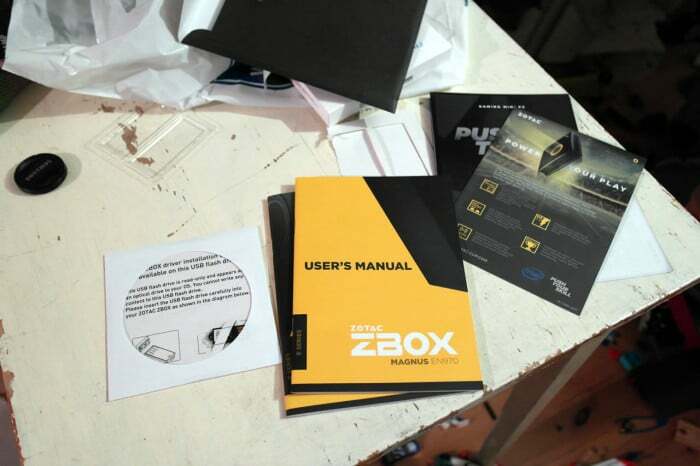 It is shipped in a nice-looking bright yellow box which shows off some of the features of the PC. Together with the actual PC we also get a USB-stick with drivers, a DVD with drivers, a external power brick and a small WIFI-antenna (not pictured here). 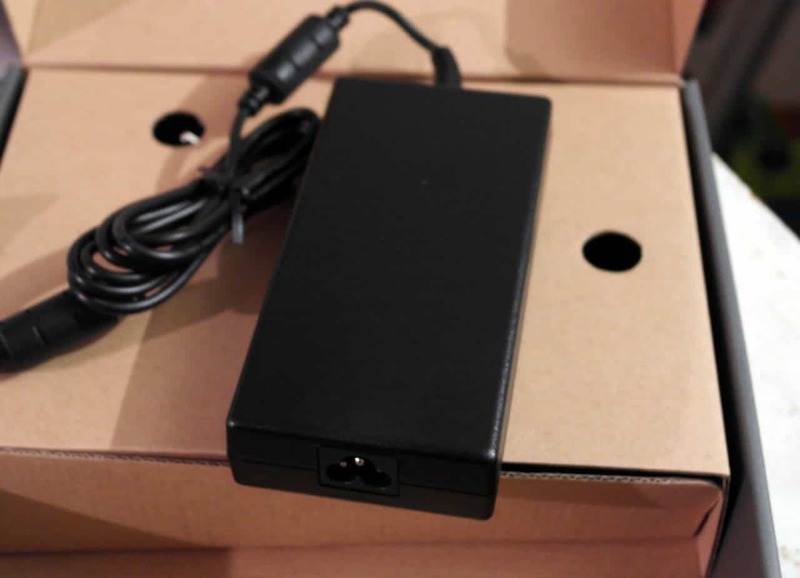 The power brick is quite big. And here it is. The Zotac Magnus EN970 in its glory. it’s a low profile mini-PC which has increased in width and length compared to Zotacs other mini-PC’s to accommodate all the components including a regular 2.5″-drive and a M-2-drive. It is black which means it will fit with most other HIFI and TV-devices. At the front we find the power on/off-button, a memory card slot, headphones and microphone-connectors as well as 2 USB 3.0-port. As we turn the PC around things get a big interesting. We get two USB 2.0-ports and two USB 3.0-ports. So far so good. The dual Ethernet ports is a bit surprising since that is what you often find on a bit more expensive motherboards. The four(!) 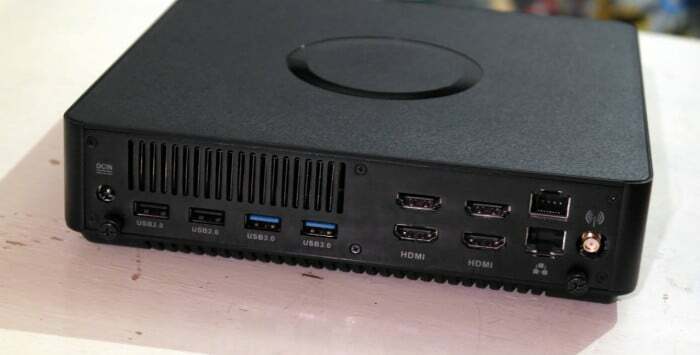 HDMI-ports however are not something you usually find on a PC. 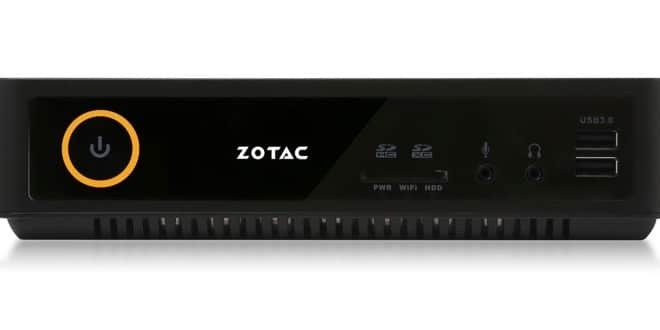 We get the impressions Zotac just decided that instead of offering either a regular DBI-D-port and/or a DisplayPort-port it would be fun to put four HDMI-ports on the PC. It kind of make sense though. If you want to use the PC with many monitors you most probably will stop at 1080p resolution on each screen and that works well with HDMI and HDMi also is a connector you find on basically every monitor and TV now. Visible here is also the holes that have been cut to let the air circulate out of the PC. On one of the sides we find another set of cut out slots for the air circulation. On the bottom of the PC we find rubber feets and the lid that can be removed to get to the inside of the PC.